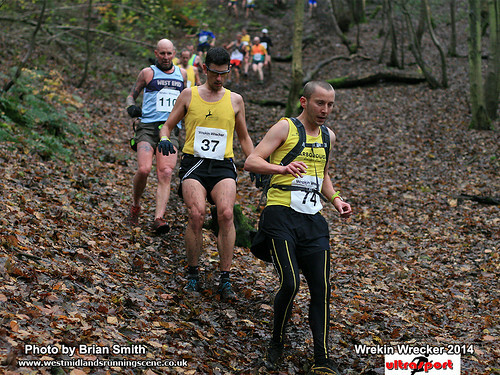 Mid-November; The Shropshire Hills; 8 Miles; 2400ft of Climbing - not everyone's idea of 'fun'; yet this was the resume of what drew five of Harborough AC's more hardy souls to the 2014 'Wrekin Wrecker'! And with runners being obliged to "carry waterproof whole body cover, hat, gloves, whistle, map and compass", on pain of disqualification, the testing nature of the well-known Fell Race is certainly one not to be underestimated. Alongside around 200 other similarly-clothed entrants, the HAC contingent successfully negotiated each of three tricky descents en route in all but one case, with Matt Driver succumbing rather less delicately-than-planned to the pull of gravity, suffering a mild concussion into the bargain. That fall, though, would not stop him from going on to achieve a highly-commendable 71st-place finish, in 1:20:23. Some ten minutes ahead, however, was the first yellow-and-black clad athlete; in the form of Gareth Wood. His 1:10:44 giving him a tremendous 30th spot overall. Also earning himself a top-100 berth was experienced Fell exponent, Graham Rolfe, whose 1:25:59 gave him 99th position. Luke Maher followed, in 1:38:39 (for 154th), with Pete Leach rounding things off in 177th (in 1:49:40). The previous weekend, meanwhile, had Jacquie Hanmer also on the off-road routes, as she tackled the Beacon Hill Trail Half Marathon. At Leicestershire's iconic country park, a time of 1:47:08 gave her 38th, from a field of 220. The same day, Marise Taylor notched another 13.1-miler to her check-list, at Stratford-upon-Avon's RaceWay Autumn Half. 200th position was garnered through her 2:03:13, for another typically-strong performance. On an endurance front with a difference, Kyle Barber took part in the 2014 'No Finish Line', in Monaco. Held over eight days, and all in aid of charity, runners navigate a 1.4km loop as often and for as long as they choose, with each completed km raising one Euro for the supported good causes. Barber eventually managed to cover some 188km - a total that saw him place 195th from 11,256. Elsewhere, and in similarly clement climes, Yvonne Scarrott journeyed to another Mediterranean aspect, for the Benidorm Half Marathon. A renowned competitor in the FV45 bracket in central England, Scarrott's decision to travel a little farther a-field paid due dividend, as a clocking of 1:40:50 yielded 361st place overall, and second spot in that age group, from 1330. Indoors, and Karen Brooks got her 2015 pre-season focus underway, at the Notts Athletics Indoor Meeting, held at Sheffield's EIS setting. Over the 4-lap 800m distance, Brooks 2:37.9. Although evidently very early in the campaign, that time is already good enough to see her ranked fourth all-time on for the FV55 category, and there is clearly a lot more to come! On the Parkrun front, Kenny Anderson ensure the Harborough vest was on display north of the border, as he negotiated Glasgow's Pollok Park, over the customary 5km distance. 22:08 secured him 62nd, from an entry of nigh-on 350.